Lake Hamanako, freshwater and seawater here, mixing together becoming one – is famous for the unique cultivation of eels. These eels are highly nutritious and one custom observed in Japan is to eat them in summer, when people tend to lose their appetite because of the heat and humidity. Among the various ways to enjoy eating eels, the most popular is Kabayaki. 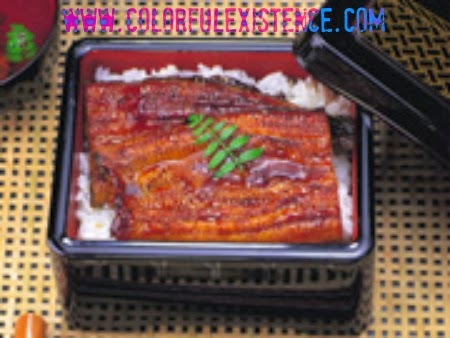 Kabayaki means charcoal-broiled style – eel. In the Kanto area, eel fillets are roasted over charcoal and are steamed once, after which they are roasted again over medium heat while basting. In the Kansai area, a whole gutted eel is roasted on a skewer while basting. Una-ju or una-don is the name for this dish, topped with roasted eel on a bed of hot cooked rice and covered with basting sauce, is very popular regardless of the season. Many restaurants in the Lake Hamanako area feature these dishes on the menu.